Beverly Hills Silver has been a trusted manufacture and designer of fine sterling silver for over 25 years. Our brand and many private labels can be seen in many of the largest retailers throughout the U.S. We’ve decided to bring the Beverly Hills Silver glamour directly to our loyal customers and so, we’ve created Beverlyhillssilver.com to bring you up to the latest fashion, before it even hits the market! The quality of jewelry we provide, from the grade of stones we use to the platinum finishing, is why we have been around for so long. Our company Moto has always been “let’s dress like were in Beverly Hills….. at a not so Beverly Hills price….” And with the establishment of Beverlyhillssilver.com we are doing just that! Never compromising quality and design and yet still providing affordable prices, is our goal at beverlyhillssilver.com. Now, the pendant that I received is just beautiful! It is a .925 Sterling Silver Double Row CZ Gemini Horoscope Pendant. 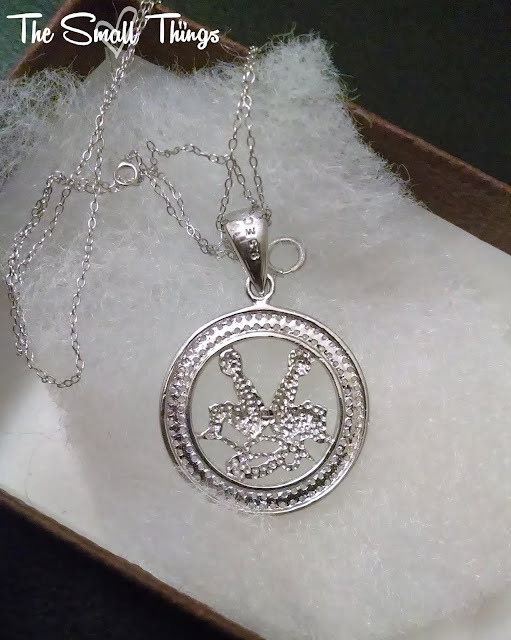 It also has a Sterling Silver chain included. When I see this pendant, I think ELEGANT! Because all of the diamonds are beautiful. Now these are simulated diamonds, but you really can't tell the difference! This pendant is so beautiful! I love that it is not too big- it is the perfect size and fits me beautifully! I also love the double row of diamonds! It gives the pendant a ton of bling. This pendant being made for a Gemini and it is a great fit because of a gemini's color [Their colors are silver, glistening white, and all shimmering things.] My husband says that is all women though! Overall, I love my new Gemini Horoscope Pendant! It is beautiful and I plan to wear it often! If you want to purchase one for yourself, you can do so on their website for only $62.00! This will make the perfect gift this Holiday Season! That is why I am recommending Beverly Hills Silver for my Gift Guide! They have pendants for every horoscope so be sure to check them out! Beverly Hills Silver is giving away 1000 pairs of earrings to the first 1000 people to like their Facebook! ENTER HERE You just pay $5 for shipping! That is IT! They are beautiful and would make a great gift! They are a $50 Value! $5 for something that costs about $50 is a GREAT deal! This is a great stocking stuffer too! Visit them on their social media to stay up to date with the latest!